Jazmine-Marie Cruz rallying attendees of the 2019 Young Women’s March Rally. This past weekend, I hosted the Young Women’s March Rally in Chicago. I never really thought I’d be able to pull off something of that scale and have it be successful, but it was. We had upwards of 300 people come and rally in the middle of a snowstorm! It was incredible; so many men and women were gathered together to show unity, support and empowerment. Organizing the rally was a process that was time-consuming and stressful, but very much worth it. The journey started Jan. 4, 2019, when it became official Chicago would not host a Women’s March on Jan. 19 to coincide with those throughout the country. 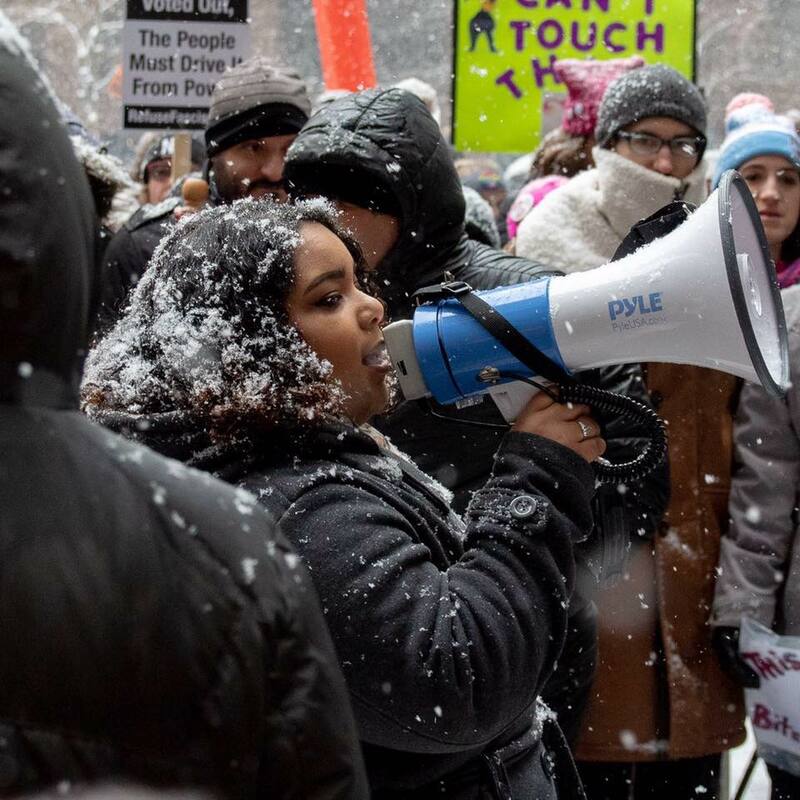 The organization Women’s March Chicago hosted its first-ever March to the Polls this past October, but later announced they wouldn’t participate in the third annual Women’s March in January. Once I caught wind of all the news, I discovered no one else was planning to organize the event in substitution. That meant that Chicago, the third-largest city in the United States, was going to go unrepresented on the 19th, while other big cities like Washington D.C. and New York were. From there, I had the option to either be disappointed with everyone else and let the day pass without Chicago having its march, or I could try to take it on myself and make it as decent as I possibly could, as a college student with limited resources. As you know, I chose the latter. I had all of about two weeks to plan it fully. I reached out to Women’s March Illinois and they helped me get into contact with sponsors, organizations and media contacts. Eventually, Young Women’s March Rally became a new face in the world of activism. We got followers and people who wanted to hear my voice and the voices of all the people I represented. Everyone was so surprised that a girl from a small town in Wisconsin could actually plan something to this magnitude, but I managed! What we accomplished that morning was amazing; however, we faced a lot of last-minute complications the night before and the morning of the march. We had a couple speakers cancel on us, almost all of our volunteers didn’t show up, those who came to help crowd control did not have the proper vests to identify themselves because the organization providing the vests didn’t deliver them, and on top of that, we got hit with a nasty blizzard the morning of our event that didn’t stop until it was over! Each of those factors unfortunately gave a blow to the march in their own ways. The snowstorm was the major hitter, though. The wetness damaged our sound system, so we had to use a bullhorn for the rally, and the bad weather and lack of vests for our marshals made it risky to carry out our original plan to march toward Trump Tower, so we modified the path to go around Federal Plaza. The snow kept a lot of people inside their homes as well. Had the storm not happened, we expected at least two- to three-times as many people would have participated. Our first rally ever was a little rough, but we took the hits and kept on going. I did it because I want to influence the next generation of girls. I have a vision for my organization. Young Women’s March will be going into high schools and middle schools next, teaching girls how to become activists and have confidence in themselves. We are also planning a large rally for International Women’s Day on March 8. We’re going to take what we did and what happened at our march and learn from it, and make it better for the next one. Most importantly, we are going to keep building our brand and expanding to make a real impact on young women in our community. I have a great support system to help this along, both in my relationships and in my school. Roosevelt University’s deep-rooted beliefs in social justice gave me a very good platform to have the confidence to make this rally happen. I hope next time, more people from Roosevelt can come and show support. Hey Jazmine, my name is Hannah Ballerstedt from the Roosevelt Torch! I was wondering, would you want to do an interview about the young women’s march?